The head of a flower, the face of a snowman, the body of a slug, and a candy cane for a...belt buckle. (Please, let's just go with belt buckle.) 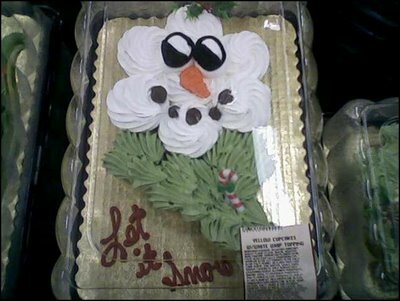 "Let it Snow"? How about "Let it Go" - as in, away. Far, far away. What IS that little bump? A tail? Now the bumps are on the side. What does it mean?!? 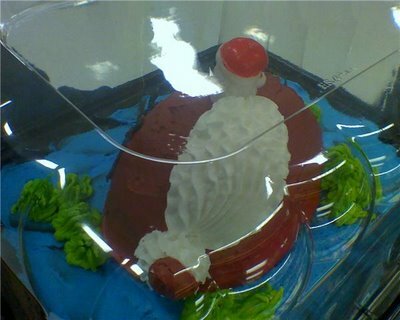 Try to picture those "cakes" without the plastic Santa heads for a moment. I'm getting a real "raw meatballs sitting in radioactive waste" vibe - how 'bout you? Thanks to intrepid Wreckporters Brittney E., Meredith O., Kelly D., & Heather K.! *I'm told this is actually a Grinch cake. Not sure that alleviates the wreckiness, though. BELT BUCKLE!! I wet my pants. "Frog laid open in dissection" was the first thing that crossed my mind when I saw that first one, too. For the Santa-headed blobs I'm thinking leftover football cakes, with the white fuzzy stripes covering up the stitching. These are the most wrecky yet! EEK at that "Grinch" cake!! Word verification: ookimpr: I'm speechless. Jen, you've missed the most important point of all. In this season of commercialism and such materialistic focus, a few brave decorators are doing their part to cut down on the money spent(or the desire to spend money) by those feeling the economic pinch. Yeah, I suspected grinch, but that doesn't diminish the wreckiness. It's still godawful bad. 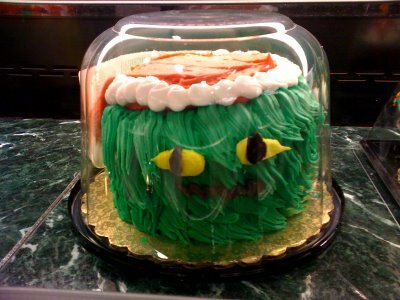 The Grinch cake looks more like Oscar the Grouch! December 17, 2008 | Erin T.
A grinch? A GRINCH? I'm still working under the assumption that it's a yule-tide Oscar the Grouch. 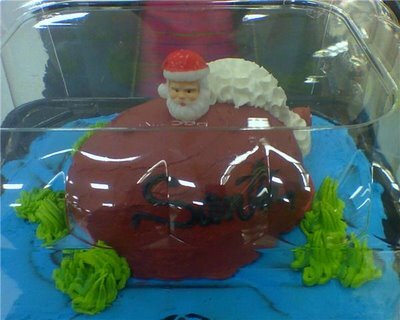 And as far as the poor Santa trapped in a meatball, I wonder if it's red velvet cake underneath? Imagine the faces of the children when Mommy cuts that one open at Christmas dinner. That's just all wrong. Creepy and wrong. You're a vile one, Mr. Grinch. No really, we mean it. That looks more like Oscar the Grouch on steroids. 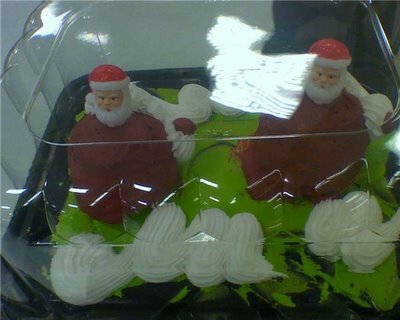 As for those horribly bloated Santa cakes, I don't know what to say. 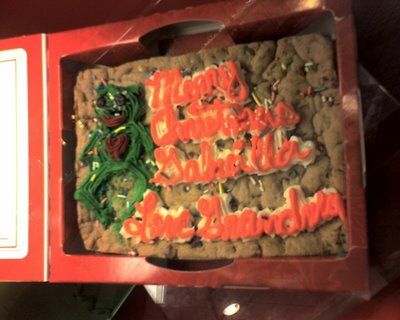 It disturbs me a bit that they had to write "Santa" in black icing so we'd know what it really was. I'm not sure if I like your theory about the Wonka gum or if Santa is just having water retention issues. Man, those last ones are mystifying. Does Santa boast the mullet to end all mullets? Or has santa become a mullet, writhing like a mermaid on a red-hot lava rock? My mind is boggling, and it hurts a little. word verification: whiesman. "Why oh why?" they whined as they followed the star. "It's all just gonna end in wreckiness in a few thousand years." That is not the Grinch, that is totally Oscar the Grouch with a Santa Hat. And the complete mystery cake. I assume it was a Santa Head on a football. That second photo looks more like Oscar the Grouch than the Grinch. What the flaming hell? I especially love the first one. What is that, some kind of pine tree gremlin? Better be good this year or instead of coal, you'll get one of these little guys popping out of your tree on Christmas morning! The green freaky head under glass is great too. And I can only guess that Santa has some REALLY big, tied back hair on those last cakes, and that he apparently no longer posesses arms or legs. Perhaps a run in with tree gremlins? I believe that the top "frog" is also a Grinch - his heart is growing three sizes (right through his chest). The bandy-legs are just because he's had a bit of chaffing from riding around in that sleigh. I am laughing so hard it hurts. Literally. Too many sit-ups on Monday, but... uh.... I'm gonna go laugh at the meatball santas again!!! DUH- That's obviously Walrus Santa. He's really tiny and rides on Rudolph's nose while Human Santa is out delivering his presents, and leaves all the good little Pinnepedia boys and girls bukkits under their Christmas icebergs. The Santa-Bowling-Ball creatures are going to haunt me with the green thingy. It managed to scare my three-year-old. Maybe the bump is a scrunchy at the end of his mullet? All I could think of is that it looks like the whale who swallowed Jonah-Santa. The one cake looks like Oscar the Grouch with a Santa hat. When I read how "love grandmom without the comma is more like a command" I started thinking of the movie Zoolander and the weird hypnotic "Obey my dog!" line. And the weird Santa lump cakes are beyond weird. Hummm maybe it's santas bags ( get your minds out of the gutter, it's those bags he use to bring gifts) it would explain the little tail and all....but not the decapitated santa. I always laugh at your posts, but "please lets just go with belt buckle..." ROFL! Thank goodness you managed to explain the green monster - but the huge santa pimples are still utterly baffling. Santa stuffed in his toy bag? Love Santapillers, imagine the adorable caterpiller/santa cake that could be made! Not that caterpillers have ANYTHING to do with Christmas, just cute! I agree that the grinch is Oscar the Grouch. I think perhaps the Santa blobs are supposed to be santa hats. That would sort of explain the "tails." Why there is a santa head on them I cannot explain. I also thought Oscar the Grouch for the green thing. And I think that those are depicting the return of the Great White Santa Whale. It's a Norwegian folk tale in which The Great White Santa Whale crawls up on the rocky shores of the fjords and blows presents and candy out of its blowhole for all the good little boys and girls. I drop by every morning for my first laugh of the day, and you NEVER disappoint! The wonka santa has me crying... this is the greatest blog of all time. Wow, Santa-pillars! I was under the impression that insects didn't believe in Santa Claus. In all seriousness, I believe the large red blob thing the Santa head is sitting on is his sack full of gifts. That, or it's a cocoon? Maybe the last ones are leftover turkey cakes? And they just stuck Santas on them? Maybe? I don't know. aww, belt buckle? but the alternative is alliterative! Nightmares of Santa slugs will now dance in my head. I agree, I think that the first cake was probably intended to be the Grinch with his larger heart, but my first thought was Kermit. "Bring me the head of the Grinch on a platter! Under a glass bell jar! Or a plastic dome. Whatever." Those Santa Slugs look like baby Harp Seal pups trying to avoid getting clubbed to death in the annual harvest by donning Santa masks. "You wouldn't club Santa to death, would you?" The inscription looks like: "Merry Christmas Godzilla Love Grandma"
I didn't know that Godzilla had a Grandma, but there y'go. Second cake: Oscar as Grinch. Elyse, good call on the dissected frog actually being the Grinch! With regard to the Santa balls, I just have no words except what the hell. I just don't even know what else to say. I was thinking with Yani at first .. santa's bag o' toys, but why no body? is he IN the bag? Then i remembered the cheesy movie about 4 years ago "slither" THAT'S what they were going for!!! the girl in the barn who eventually exploded into lots of the worm looking things that are crawling up this santa! Whew glad i cleared that up in my head! The Grinch cake looks like a green koosh ball that somebody slapped facial features and a hat on. The Santa-pillar has me speechless. And what the heck are those green blobs? . . . Wait, I've got it. Maria is right: It's Walrus Santa, and the green blobs are the icebergs he leaves the bukkits under. As if it wasn't bad enough, I think Gabriella's name is spelled wrong. Unless her name really is Gabreilla. Good news is you can scrape icing off a cookie without too much damage. Happy Froggydays everyone! WV is phiallik as in phiallik candy canes are inappropriate decorations. At least the Grinch/Oscar the Grouch head looks like it could be something... I mean, normally I can make some sort of sense out of even the worst wrecks, but those Santa blobs have me completely stumped. I have NO clue what the baker could possibly have been thinking, but whatever he's smoking, I want some!! Maybe the big red blob is Santa's body?? And the other things are mittens??? I think these have to be some of my favourites!